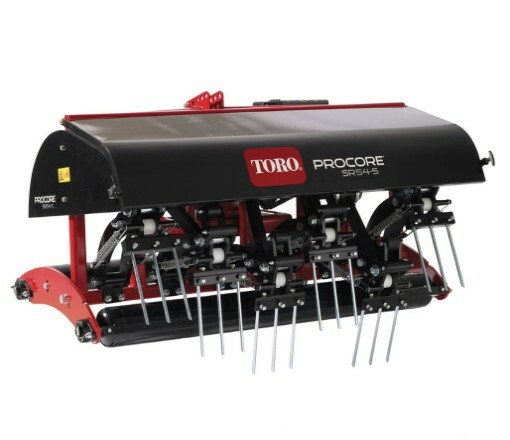 Last week we were able to get all of the greens punched with our deep tine aerator from Toro. It took 12 hours at 0.8 mph, but it is well worth it. Since we started doing this last year our roots have been much longer than normal which is by no coincidence. 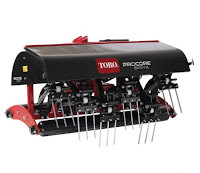 If you recall, I wrote an article in May about our roots, but I failed to mention that the deep tine is a big part of that. From the pictures below, root depth and hole depth are almost equal. Aside from great rooting, we get better air/ water exchange through the soil profile and we also break up the small pan layer we have. A pan layer is formed typically around 3.5" deep where normal greens aerators typically go down to. When inserting a soil probe, you'll feel it get much firmer to press in at this layer and water will also have a hard time getting through that layer.